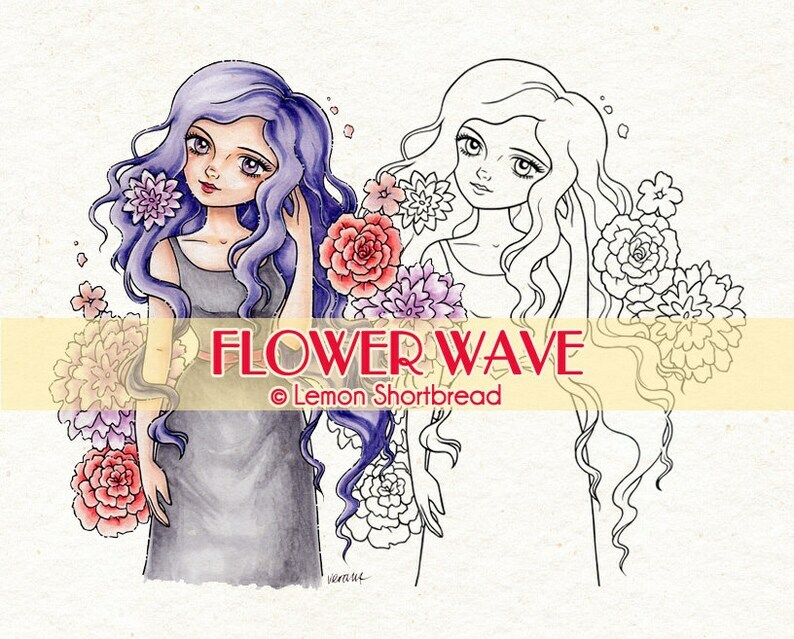 This listing is for 1 digital stamp / colouring page titled 'Flower Wave'. Long haired girl with flowers all around her! You get a high resolution 300dpi JPG file and a transparent background PNG file. Coloured examples are NOT included in the sale. The artwork is 7 inches height. 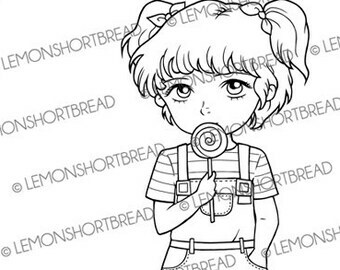 There are no watermarks on the actual artwork, the file can be downloaded from Etsy after payment has processed. 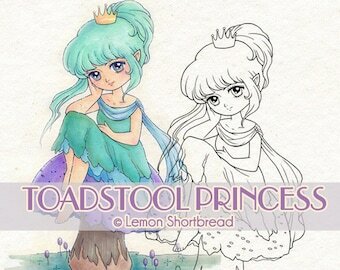 My artwork is first drawn on paper and then scanned. It has precise lines because I spend hours just touching them up so you get a nice clean base to work with! All digis are in Grayscale mode, you can convert them to RGB if you want them coloured. - Image is to be used by the purchaser only. - I allow limited license for only individually handmade items - that means like singly produced cards created out of your own hands to be sold on a very small scale, not mass produced. - You may use the lineart in digital coloring, but not post it as your own on any digital medium, DeviantArt.com or any websites without proper credit. - Images cannot be used to create logos, clip art, or for other commercial use including print-on-demand merchandise. - You may not distribute, resell, share, lend, trace, or mass produce the digital file. - You may not post the uncolored or un-watermarked images on blogs or websites. - You may not reproduce the image on rubber or similar physical stamps. 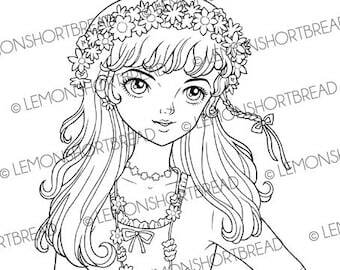 - You may not alter this image digitally in any way, including use in collages, colouring books, or kits for commercial use. 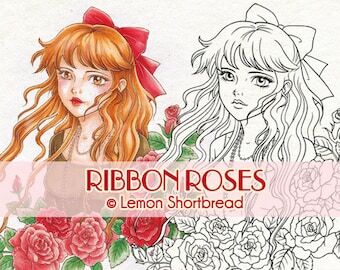 - Please credit to Lemon Shortbread Art or my shop, if your craft is made to be sold. - Due to the nature of this digital file, no refunds are offered. - Artist retains all copyright, and there is no transfer of copyright with the purchase of this listing. For larger commercial use, please contact me. Love this image!! Instant download too. Used edible paint to paint the image on a sugar cookie for Valentine's Day. Used edible paint to paint the image on the sugar cookie. I love the way the girl looks at the snow! So sweet! It was nicely drawn for any boy who likes water sports! How long does it take for me to receive my package if I live in the USA? Delivery times vary depending on which state you live in. - CA / NY / HI : around 14 business days. - Other states: 3 - 6 weeks. 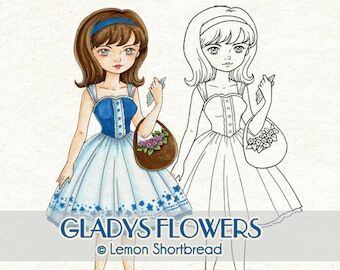 - All packages ship via registered mail (signed-for) from Singapore. Tracking for USA, UK and some countries only lasts upon reaching your country borders. You sign for it when it arrives at your doorstep. There is no detailed tracking unless you upgrade to Speedpost Standard. - An item is considered 'lost in transit' only after 60 - 90 days have passed, depending on your country. - Packages are marked as 'Others' and true value declared on the customs form. - Buyer is responsible for customs fees, VAT & tariffs imposed by their government. Please check what your purchasing threshold is for overseas orders so you don't end up with unwanted surprises, thank you. Are you an Angel stamp company?